Liverpool striker Daniel Sturridge says he offers guidance to fellow Reds forward Raheem Sterling off the pitch, and he is "proud" of the youngster's performances. Sturridge, 25, netted on his comeback from injury in a 2-0 victory over West Ham at Anfield on Saturday, after Sterling had opened the scoring. 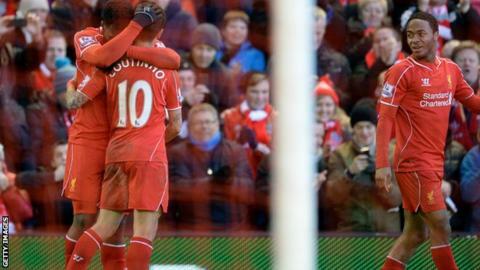 "Raheem has done extremely well," Sturridge, who had not played since September, told LFC TV. "He is working hard and I am proud of him as the older brother to see how well he has done." Sturridge added: "I hope he continues working hard and continues playing the way he has. He is improving every single day and he takes it in his stride. "He doesn't get too big headed or overly confident and I keep him under my arm when he goes through difficult times. I give him all the credit in the world." After a slow start to the season, Liverpool have improved and picked up their fifth victory in six Premier League games. Raheem Sterling scored his first Premier League goal at Anfield since the opening weekend of the season against Southampton. Daniel Sturridge has scored in five of his seven substitute appearances for Liverpool in the Premier League. Sterling, 20, opened the scoring against the Hammers in the second half, after latching on to Philippe Coutinho's clever pass. Substitute Sturridge doubled the lead within 12 minutes of coming on with a low drive following another Coutinho assist. "It was a great feeling to help my team get three points, that is the most important," said Sturridge. "We are showing we have the character and are willing to work for the fight."